Nicholas Anthony has been a well known name in the amateur bodybuilding circles for the past 5 years. The kid from Cyprus with the giant quads has been competing since his early teens, winning the Cypriot championships several times and placing well ahead of the pack in international competitions, including the 2004 IFBB European championships. In 2007 he won the "stars of tomorrow" bodybuilding show in London beating athletes who went on to gain pro status. His latest success was his 3rd place finish in the 90kg category at the 2011 Arnold Classic Europe Amateur, a competition with deep lineups from all over the world. Since then Nick has been preparing for his next show, the 2012 Arnold Classic Europe Amateur which will take place from October 11th to the 14th in Madrid, Spain. In this exclusive interview Nick talks to us about his ongoing contest prep, his experience as a competitive bodybuilder and his lifelong dream of becoming a professional. We wish Nick best of luck in his upcoming battle and to make his dream a reality. KM: Hi Nick, first of all, I want to welcome you, and I want to thank you for your time. You are very active on Facebook lately and other social media, updating with a lot of your prep photos and news. So, I would like to ask you what is your current plan for competition and when did you begin your preparation? Nick: Last year I was living in Holland for about seven months and basically Sybil Peters helped me for my preparation for the Arnold Classic in Europe, in which I came third. After the Arnold, I stayed another month or so in Holland and then came back to Cyprus. Then basically I stopped working with her because she didn’t have any time, so things weren’t working out. I still wanted to compete for the Arnold's in Europe, and to place a little better. Everybody competes to be first and at the end of the day you can’t say I’m happy I came third. So I didn’t come in as I wanted it to, I was too flat, so I wanted to compete again, kind of in the best shape that I want, and get proper placing that I think I should get, coming in at 100%. So I was on and off doing my own thing, you know? Prepping on my own off season basically. But it was a strange winter, I had many obstacles, personal and work related. So I managed to do some part of the off season, I started dieting but It didn't feel right. KM: How did your co-operation with David Balasas start and what was your relationship with Michael & Helen Kefalianos prior to that? Nick: I always talked to Helen and even when I placed third at the Arnold Amateur she was the first one to talk to me after the show. So after a while, I was talking to Helen and I told her you know I want to compete again at the Arnold Amateur, and the days to start my prep were closing in. I always need that person to tell me stop fussing around, to get me tighter or you have to eat more food, you know? The extra person behind you. Because everybody can get cut at the end of the day you know, but that extra look, extra drive, a little advice & motivation is always needed. So I told Helen, I'm lost, I don't know what to do etc. and she sais to me "come to Kos, Mike can help you". And I wanted a little break from Cyprus as well, so I thought I might as well go there, you know? So they invited me but Mike couldn't take me under his wing becaise he was doing too many shows one after the other. I was lucky because Vaki (David) took me under his wing. Basically I has a couple of workouts with him as well but I didn't stay very long, only a couple of days. So from then on I have been working with Vaki. Helen & Mike communicate with me very often for support too. We are a team at the end of the day, like a family, you know? The chemistry is good. Vakis is tough, he will say it like it is. Very strict, which is good! And you got the motivation of seeing Mike, you know? What he's accomplished and everything. There's a lot of people that say "ah there are other pros, Greek pros better than him". At the end of the day he is competing for the third time at the Mr. Olympia, so they can talk all they want! He's the one who won a pro show and his placings are really good. No one has done that yet, you know? It is really motivational for me that I’m actually a part of that team and getting ready. And going to Spain with them it’s even more motivating. Basically, it's like, I will call Vaki, he keeps me in line. He tells me, "train this here, train that there" etc. You might need some more emphasis on your upper chest so I'll train my upper chest hard for a week or so until we see a difference and he'll say that's good. That's what I was looking for, you know? Work on your triceps, try this thing, remember what we did together in Kos, I'll say "yes", do some more of that. So up to know, knock on wood, everything is on the dot. It's crazy, I am transformed! KM: Yeah, I know you did. I can see it in your most recent photos. Nick: Yeah, it’s like I took pictures on Thursday and I didn’t think it was me. My training partner sent the pictures to my i-phone, I look down and I think “Oh, it’s me” and then we were laughing. I didn’t think it was me. So everything is going good, I am getting good comments, and even from Juliette Bergmann because I will compete for the Netherlands, she’s the one helping me in that department. I send her every couple of weeks progress photos. I’m competing for her country at the end of the day, so she has to see if I’m worthy or not. The last time I sent was on Friday, she didn’t comment, she was like “wow, bravo, continue what you’re doing”. 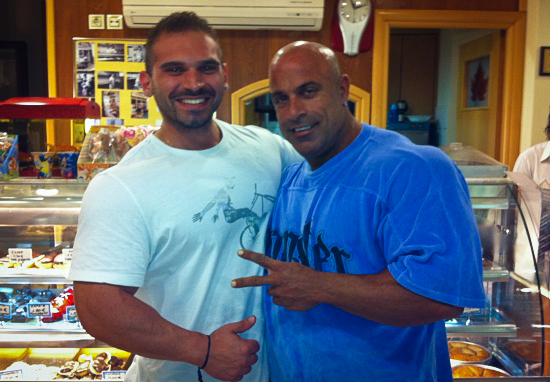 KM: When did you actually start your prep for the 2012 Arnold Classic Europe? Nick: It’s been 11 weeks now. KM: 11 weeks and you have another two months? Nick: I’ve got another 7 weeks, 11 weeks I've been prepping. KM: So it’s a total of 4 months in contest training & dieting. Nick: 18 week prep, yeah exactly. KM: What would you say is the difference you see now. What are you doing differently that you weren't doing before and you are doing differently now with David? Nick: Basically, he showed me that everything is more simple than actually what it seems, not as complicated as we think it is. And not to overtrain, to use your brain a bit more and train with your heart. Train with your heart so you can give 110%, because when you train with you brain you’ll tell your body to give 90% because that extra 10% is so that you won't get exhausted. And to use your logic as well, stick to the basics, to the things that you know that work. And work! Keep your head down and work. At the end of the day, no one is going to do it for you. I have to get up in the morning and do my cardio, nobody is going to get up there, so be humble, be balanced. Be balanced in everything you do, and you get results. There is no magic pill. We saw with Mike, he’s been doing it for so many years and now he’s achieving this. It’s hard work, dedication, being humble, being who you are, respecting yourself, respecting other people as well. That’s it basically. KM: Excellent. From what you are saying and as I understand it, you’ll be competing for the Netherland, correct? Nick: Yes, for the Netherlands. KM: How did that come about? You could have competed under Cyprus or England as I understand it, right? Nick: Yeah. Last year, I went through a change so I moved to London but did not really like it there. It was at the British Grand Prix in March I met with my friend Neil Hill and we started talking and whenever he came to London we trained together as well at Muscleworks. So anyway, I ended up picking up Sibyl and Roelly (Winklaar) from the airport and taking them to their hotel. And we got to talking and kept in contact. Sibyl messaged me a few times and asked how I was, If I liked London etc. I said no and she said "why don't you come to Holland? I can help you with your prep and you can work here as well". I was planning on doing the Britain's back then, so I got my bags and without even knowing where I was going, I went to Holland. I lived there for about 7 months and trained with Roelly as well. She was helping me with my prep and she's like why don't you do the ASC Amateur? And I was like, "how"? Cyprus won't help me because I am not there to compete for Cyprus. And she's like you've been here for so long and you've been living here as a resident. Let's try to do something with the IFBB here and if they say the OK, you can compete under Holland. So that's how it happened, it didn't come automatically. KM: Yeah, I understand, you were living there, you were a resident there so you could compete. So now you’ll also be competing for the Netherlands, right? KM: And what category you are going to be in, do you know? Nick: Under 90kg again. That was the target we discussed with David. To weigh myself let’s say at 89.9 because I think I have a day and half until the competition after the weighing. So I will be bigger and fuller over 90kg. I can’t tell you now for sure, what’s going on, we are just going on how we look, at the end of the day. My body is reacting differently now, I’m eating more now, I’m training heavier, I’ve got a lot more power this time in my prep, and so we can’t say till at least at the week before the show, two weeks before the show. It’s also up to him too you know, because he’s the boss. If he says you look good in 92, I go into 92, I can’t really say anything. I trust him and that’s that. KM: And Nick, what is your goal? Is it to become a professional? Nick: I would like to turn pro, it’s been a dream since I started weight training when I was 15,16, you know? Things changed now, getting the pro card. Now it’s either the IFBB world championships, the Amateur Olympia or the Arnold AC in Madrid or in Ohio. Winning one of those I think, even the European, winning one of those, will get you a pro card. KM: So, it’s definitely tougher now for Europeans. Nick: Yeah. Now it’s much tougher. Before it was easier. It’s tough because lots of pros are not pro material, yeah, so that’s why it changed this year. KM: And your goal will be to be in the 212 category in the pros? Nick: Yeah. That’s my goal. KM: Cause honestly you know, I’ve seen pictures of you from when you did the British Nationals and over the past couple of years and you have great potential. You got a great, build and you could do very well in the 212's. Nick: Yeah, I actually even saw photos from the Dallas Pro the 212, and compared me, I’m not saying I would have won the show but I would have given them a good run for their money, you know? KM: Yes, absolutely. So, let me change gears for a second here and ask you. Talk to us a little bit about your training and your nutrition. In general, what you eat, what style of training do you do, cardio, you know, just a little bit of information. Nick: Yeah, my training is a bit unorthodox. I like going heavy. I always change my training every couple of weeks, every two weeks, Vaki told me this, and I get bits and bolts from people I’m training with. I train one body part a day, I train 6 times each week. I can do 600 reps for my chest, in one session. That’s a bit crazy because you’ll say five exercises of I don’t know how many reps, it comes down to 50-80 reps normally, but I do 600 in some days. Some days I go crazy heavy, low reps, you know? Then, I’ll drop down to recovery training, which I keep my rep range between 8-12 reps, and basically a couple of 4-5 exercises 3 sets each. And then I’ll hit circuit training for a week to shock that different type of fiber muscle. And I believe, to make a nice rounded muscle, to make it more muscular, you have to get in there in different angles. The body is clever in adapting, I don’t believe there is one style of training. You have to mix it up, like Bruce Lee said, water changes in any shape, it can be strong, it can be weak, you can punch it, it hurts, put your hand through water slowly, you can go through it, you don’t feel it, that’s how I believe training is. So you change working different muscles and things. KM: And what about your current nutrition? Nick: Nutrition is basic, man. Basically, I eat different types of protein, some yolks, I hate chicken and I hate tuna, so I eat some turkey, beef, pork, lean pork, and fish. I rotate the protein and now the pork is out because the diet is getting stricter. We’re rotating the different kinds of protein and of course protein powder. Carb wise, potatoes, rice and some fruit. I like strawberries and pineapple. And that’s about it. Simple diet, man. No low fat, no high fat/high protein, no carbs, or any of these crazy things like eat junk food all weekend and drop down to zero carbs from Monday through Friday. This and that. Basically it's eating foods to have energy to train well and to burn fat. KM: So you are eating foods that are high in nutritional density, right? Nick: Yeah, so it fuels the body, so you can train hard, and burn, and build. KM: What about your cardio work? Nick: Cardio, this year, I’ve actually done less. I’ve been doing cardio three times a week only. Only this week we upped it up to four times a week. Because like it or not, it’s close to the competition, we have to do that and we’ll see in a couple of weeks maybe we’ll drop down to three, you know? KM: That’s a little bit unusual though to me, cause usually as you go closer to the show, you increase the cardio. Nick: Yes, I don’t, it’s working like this. I’m also training much harder, different types of training, I believe this kind of training helps me burn fat as well. KM: So maybe your workouts have less rest periods in between sets now? Nick: Yes, less rest, going to high reps some days, and keeping tense. In and out. Keeping the heart rate, keeping the pump, making sure the nutrients go into the muscles and that’s it, you know? That’s the trick as well. I do three times to four times a week the cardio. Actually we started every day, five times, then we dropped down to three, now it’s four again. KM: Do you follow professional bodybuilding closely? Nick: Not really. I watch, I’ll google, I’ll see posts here and there, how did this guy do on this show but I’m not a fanatic like ‘he placed this, because of this’, you know? I’ll just check the results, to see how the season went for 212, I’m not a fanatic on the thing. Of course I’ll watch the Olympia and all that, but if I qualify for this, I don’t really know… If I was pro let’s say, I would, because I would have to see my competition, you know? 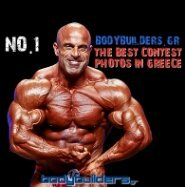 KM: Who is your favorite pro bodybuilder? Nick: I have a lot of respect for Mike because I’ve met him personally, I lived with him and we know his history which is really motivating. So Mike’s one. I like Lee Priest also cause he tells things like they are and he’s a down to earth guy. What else? I've met Phil (Heath). Phil's really good. I wish him all the best for the future, you know? He’s going strong. KM: You’ve been around quite a bit. You competed in England, obviously you live in Cyprus now, you were in Greece for a while, you did a guest posing in Greece too. You’ve got quite you know, quite a career there. But I wanted to ask you, how did you start? You started from England, right? Nick: How I started bodybuilding? KM: How did you get started with weight training and eventually moved on to competitive bodybuilding? Nick: When I was 15 I looked up to my cousins and my uncles, they would go the gym. Then if I was 15, they were 30. It’s me, looking at myself now, you know what I mean? They were going to the gym, I wanted to become like them, I wanted the 6-pack, I wanted the big chest. I wanted to be big. I wanted to be a super hero; That was the picture of what I wanted to be. So I talked to my brother and he took me to the gym with him when I was 15, and I don’t know he saw something in me so at 16 he started prepping me for the Juniors in Cyprus. When I just turned 17 basically the competition was on the 8th of October, and my birthday is on the 4th, so when I turned 17 I competed in the Juniors and I won in Cyprus. 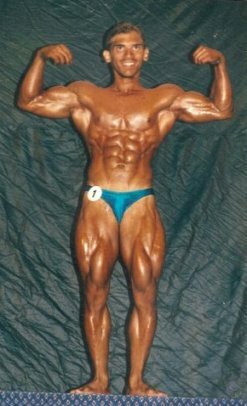 Then I got hit by the bug, I competed again at the Grand Prix after two years, went again as a Junior, again as a Junior after two years, then in 2004 was my first senior show, won the Heavy Weight Overall and competed in the Europeans as a Heavy Weight and I came in 10th from 21. It was a good achievement. Then, basically I moved back to London, I did a couple of shows there, I won the Stars of Tomorrow in 2007, and then one after the other. KM: Do you see anyone from Greece or Cyprus that is up and coming that you like and you see them achieving something in the future? Nick: You know, it’s hard because they might blossom now, but if they blossom too fast, they will burn out. You see what I mean? You might see somebody and go “wow”, but I want to see him down the road, if he keeps doing it you know? That’s what I see. If the guy is worth it or not. To get big and ripped he can do it in a year’s time, not in the best of ways, but he can fast forward it but will he last? For me, pro-athlete is lasting, making a good career out of it, being like 50 years old let’s say when you stop competing. And having a good body. That’s an athlete for me. There is a lot of people that do it in one year, they are "wow" and then they disappear. KM: I see what you mean. Nick: Cause there are a lot of athletes in Cyprus that could be good athletes, I’m not going to mention names, in Greece. 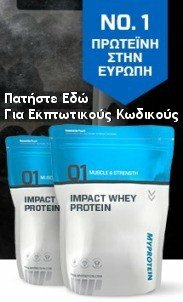 We’ll see a lot of them, they are going to compete ahead of me in the Arnold they are from Greece, you know? And some from Cyprus, they are going to compete. We’ll see how they do, you know, it’s a big show, it’s a hard show, it’s going to be bigger this year as well, more competition. KM: What was your experience last year with the Arnold Classic Amateur, how was it? Nick: I didn’t think I was going to place. I made the top 6 and I was like ‘wow’. You go through the semifinals and the finals and you are going, and it’s the top 15, the top 10, and then it’s the top 6. When they were calling out the medals, they were like “6th place” and I went up for the medal and the woman is like "go back". Then they are like “5th place” and I go up for the medal, she’s like ‘no, no, you go back’. They were laughing at the audience.. 3rd place? Ah, you know I couldn't believe it.. I believe if I was more confident then, and posed a bit harder, I would have placed better; I would have gotten more points. Because I didn’t pose that hard at the beginning. But when I found out I was in the top 6, I gave it my all on stage. The posing, I would have gained more points if I had posed harder in the beginning, you know? So that was it. I didn’t expect it, I was like “wow” I think I was staring at the medal in my bedroom for the next day & night. It was like a dream, I made the AC. KM: And obviously it is a very challenging show because there are lot of competitors. Nick: Yeah, I think 21 in my category. Yeah, man, it was like I did something that I wanted to. It’s crazy, it’s hard to explain. But it’s a good feeling. 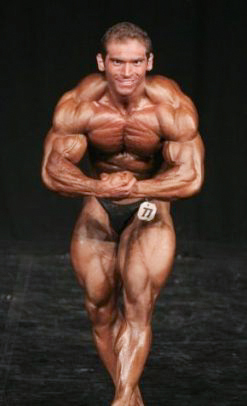 Even though I came in 3rd, just walking on stage and having behind you that sign of Arnold Classic, you know on stage? It’s crazy and you know that stage is with all the pros as well, it’s just a crazy experience. KM: It must be very motivating, right? Nick: Motivating, yeah… It’s a whole lot of things inside. You get emotional and you get motivated, you don’t know what to say. I froze. My body was freezing when I got the medal. Yeah, it’s a lot of mixed feelings! KM: And if you think that Mike, he placed 3rd in 2009 in his category, and then he went on to become pro and do very well… Obviously it can be done, you just have to have the heart, to think about your goals, and keep at it, you know? Nick: Yeah, it’s like a lot of people don’t want you to achieve in this game, in life you get a lot of haters as well, you know? KM: Oh trust me, I know. Nick: You just use that energy. That jealousy they give you to fill you up. Someone once told me, there was a saying, “Jealousy is a smell of bad cologne”. You know, that smell. You use that to power you. When they talk about you, when they say bad things about you, it’s a good thing, you know? Before I used to get upset when people said this or that but it just means they consider you. But at the end of the day always be a gentleman and always be humble to people that love you and help you, like family, because it is a team sport. Even when I go to the supermarket and the butcher keeps for me all the lean beef, he keeps the lean beef aside for me maybe he’ll make me a better discount, he’s part of the team. Even if you don’t think it, he is. He’s helping me in such a way. The nice words that someone can tell you in life or in Facebook, they are part of the team. It’s a more broad thing, they motivate you as well, so they are a team as well so it’s all a big team. The family is the closest team that really knows what’s happening, but everybody that is on your side is a team too, like your fan base. KM: Yes, I agree 100%. Nick: That’s how I feel. KM: I know, I hear you, I know what you mean and I think the more people you have on your side, the better. KM: In any aspect, whether it’s in the gym, at work, at home, online. Anywhere. Nick: The more positiveness you have, the stronger you get. KM: I mean you got your training partner, you got your trainer, you got your friends, you got your closest friends, you got your girlfriend..
Nick: Everything plays a role. Everything is a circle. One thing compliments the other. KM: Yeah, exactly, that’s it. And that’s how you win, that’s how you become great. It’s a piece of a puzzle, everything falls together and you know, you get what you want. KM: Yeah. Except you know exactly where to put the pieces, and you get the result that you want, always. Yeah, absolutely! Obviously you are a very smart guy and you know what you want, because you know, there are people that do shows and they don’t even know what they want. They just do a show just to do a show, you know? Nick: Of course, yeah. That’s another thing. KM: And you have the good mindset and the physique, to go ahead and achieve your goal of becoming a pro, and competing in the 212, that’s very very important. And I think you’ll do it. From your pictures, it’s just amazing to me the transformation you’ve made. I couldn’t believe it. I spoke to Helen the other day and I said ‘wow, how did he change so much, give me his number I am eager to do an interview with him, he’s really good’. And she said “Well, it's all Vaki, you know” [laughing] I’m like ok, I believe you, you don't have to say more. KM: There is something to be said here about Vaki and what a great prep coach he is. Everybody he helps, they become very good, you know? Of course it’s up to the person as well, cause they have to listen, they can’t do whatever they want. Nick: You have to listen! He gives you your playing cards, the deck, and it’s up to you how you play them. He gives you the chance, he gives you the good cards as well, you know, but if you don’t play them well, you lose. That’s how I feel, if it makes sense. He shows you the way, he explains everything and you have to walk through. And you have to walk through properly. It’s up to you. He clears everything for you but you have to work. If you don’t do your work, nothing will come out. It’s a team sport, like we said, it’s a team. KM: So how long have you been training and how old are you now? Nick: Turning 30 in October the 4th. KM: So, you’ve been training for 15 years, right? KM: In the 15 years you’ve been training, and you got quite a lot of experience, and you train people, what are the mistakes you’ve made that you would tell younger people to avoid, whether they are nutrition, training or competition related? Nick: Not to rush things. Not to under eat, get enough to eat, not to overtrain, to use your logic and to use a balancing of training and nutrition and in your life as well. Cause, once you balance everything out, this I was taught as well from a friend of mine in the UK, everything falls into place like I’ve told you before. Using your mind properly, your head, όπως είπα, you train with your heart but put that logic in there as well. Don’t be stupid. And yeah, that’s it. It’s logic. You see things like I was doing my lower back with my friend yesterday, hamstrings and back, and he started getting pain, we said let’s do some abs to loosen up the back. And we did some lower abs, and you see we balance the body out. We did the back and front of the body. It’s balanced. And the pain subsided. Not to over train, eat, listen to your gut feeling, don’t listen to any idiot, get advice from a proper person, because there are people trying to sell you stuff. It doesn’t mean that if a guy is big, he’s good, you know? At the end of the day, go with your gut feeling if you are going to get help. And if you don’t like that person, don’t go with him, you know? And everything it’ll show its way at the end of the day. KM: How can people find more about you? Do you have a website? You have a blog obviously, and a Facebook profile. Nick: I’m on Facebook and I have a blog I started writing a couple of months ago. And maybe you’ll find some videos of me on YouTube. I was posting but I stopped doing that because I was filming everything on my own, it was a bit difficult . And it’s hard to find a person to come at a certain time that you train and come and film you. I don’t have a fan page on Facebook. There is actually one that a person made but it’s not me. It’s a magazine they did it. I don’t feel like I am at the stage where I need a "fan page" on Facebook. I don’t want to sound stupid. That’s why all my posts, all my motivation and all my pics is on my personal page, you know? Maybe in the coming months I’ll do a fan page but I don’t think I’m in condition yet to do one. KM: Are you going to go back to Kos to see Vaki and Mike again? Nick: I don’t know when. I should go though, it would be a good break. Training with him as well, see me up close, maybe work on my posing a bit more so I pose better, this and that, stuff that I might do wrong, you know? And yeah just for a little break, it’ll be good. KM: And maybe while you’re there we can film some videos. I like how it’s so laid back at Kos. You drink your coffee and then you go do your training! Nick: It’s how it should be at the end of the day. Feeling at home and feeling comfortable. It’s training at your best. No stress, you feel at home, you say your jokes. Everybody at the gym is a family, they help each other. They have positive energy and it shows like this. It’s not as crazy as people think, or as complicated as people think. KM: Never stress, always relax. Nick: Relax, kick it back, sit back and leave things to work on their own. KM: Sounds like a plan! Nick, I want to tank you again and wish you all the best in the remaining weeks of your 2012 Arnold Classic Amateur prep. We'll be in touch and we will be updating your progress as the show approaches. Nick: I want to thank you as well Kosta for everything and we will be in touch. No reproduction of any part of this article is permitted without the express written consent of the authors.